I loved that the parody did not feel mean-spirited, and that it had a ring of “wow, wouldn’t that be great/awful?” to it as well. 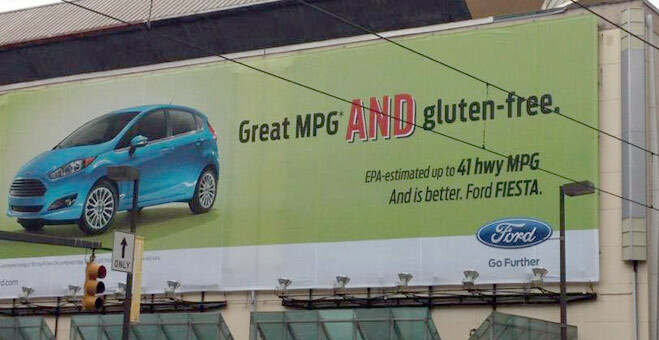 And then I saw the Ford billboard above that Gluten Dude posted and thought that was hilarious as well. Not as funny as “murder all bakers in proximity to your home” but still, I chuckled. At this point one might think I’m the easiest audience ever. One might be right, but today I saw Jimmy Kimmel’s “Pedestrian on the Street” segment and wow, did I not think it was funny. Maybe it’s because it hits too close to home as these people are most definitely dining in the same restaurants as I am in LA, and talking to the same waitstaff that I give my speeches to when I want to eat without getting violently ill. Or maybe it’s because I can’t seem to get over that gd queso gluten-ing and I’m over-cranky, but I did not find this funny. At all. This video is the “gotcha'” equivalent to going to the Olympics and asking Americans to name the leaders of every country competing right after they fist pumped yelling, “USA! USA!” Just because you enjoy something doesn’t mean you know every single thing about it. So, great, now we have proof people stop eating gluten to lose weight, or because it’s trendy. We all knew that before, and frankly, I had no (or little) problem with it since it spreads awareness. What this sketch does, however, is make everyone on the gluten-free diet look ridiculous, and in turn, make people think that gluten-free eaters should not be taken seriously. That is not helpful to me. Or to anyone else who faces serious illness if gluten makes it into the body. Instead of shooting fish in a barrel, maybe ask the experts. Like me, and all of you guys*. Because yeah, that would be embarrassing if someone who literally wrote the book on the annoying things about gluten-free didn’t actually know about gluten. But these people running in Griffith Park? That’s not a fair fight. Listen, comedy is subjective and I’m certainly not claiming to be the tastemaker of all gluten jokes. (Although if someone is hiring for that position, I’ll certainly raise my hand.) I do think, however, that I can tell when I’m being made fun of, instead of being entertained. Jimmy Kimmel and his staff clearly want to shame people, and unfortunately those of us with nothing to be ashamed about, will get lumped in with those who may be rethinking this trendy diet today. And yes, I know it’s not a comedian’s job to make sure I don’t get cancer, but to encourage intolerance for a health issue that I have zero control over is not cool. And it’s certainly not funny. It’s a call to make fun of the gluten-free because clearly we are all too stupid to deserve any kind of consideration. ‘Eff you. No, really. *By the way, gluten is made up of proteins that can be found in grains such as wheat, barely, rye and triticale that is responsible for the elasticity in flour and for making me poop my pants. Tags: gluten-free humor, jimmy kimmel. Bookmark the permalink. I also loved the cucumbers line. Hell, the whole thing was genius. Love you. Really. You’re the person who made me feel ok with admitting that gluten has made me poop my pants. Doesn’t that make you feel all warm and fuzzy inside? Anytime I can help someone talk about pooping their pants I feel personally, and professionally fulfilled. As a newly diagnosed celiac I have to say thank you for making me laugh when all I wanted to do was cry over my poopy pants!! You are a bright spot in my gluten free journey! I bet that most people on Atkins, back when that was big, couldn’t have said anything significant about the science behind it if put on the spot. They just know “bread is bad,” and that’s what people are hearing again now, only unfortunately some idiots threw gluten into the mix and confused everyone even more. I think this fad will pass, but the awareness we’ve been building elsewhere for gluten-related disorders will remain. Eventually. Sigh, I know. I have had a server put the salad I specifically asked to be put in a bowl instead of in a pita serve it to me in a pita. When I told him I asked for it in a bowl because I’m allergic to bread tell me, “It’s not bread, it’s a pita.” Then I watched him pull it out of the pita, put it in a bowl and bring it back to me. I was too angry to say anything. I gave the salad to my brother and drank water for my meal. So yeah, the clip doesn’t do celiac’s any favors. I agree, it makes the gluten free request sound like foolishness. I agree with you on all this. The Onion piece is funny and clever, but Jimmy Kimmel’s cheap shots are not. It’s easy to make fun of gf in a fad way, but good commediens should reach higher. Let’s be honest, this is about the quality of Jimmy Kimmel’s humor. I’m not particularly bothered by this piece on gluten, but I don’t find it (or a lot of what he does–which tends to be in similar fashion) particularly funny either. As I’ve said in other forums, the bottom line is that people are idiots. I’m far more concerned with the many folks who think it’s okay to generalize from this video–and/or more broadly from the diet’s trendiness and/or the ignorance of many of those who have the luxury to sort of try to be gluten-free. The great irony is that those who mock the trend are typically far more ignorant. I saw a piece that’s gone viral from a waitress railing against those of us who apparently make her life unbearable. That definitely pissed me off. Exactly, my concern is this is telling everyone “Gluten does not exist, these people are idiots” and we all get painted with the same brush. So you’re right that perhaps we should worry about the people viewing, and not Kimmel. But, come on, what a jerk! As Sharone said, medical conditions seem to really irk him, so you know, nice guy. I lived in Los Angeles for 7 years and there’s always been an abundance of shirtless, vacuous runners on the latest fad diet. I was one of those myself and I’m female. So I could chuckle about that. What I wasn’t too fond of was when Jimmy Kimmel said, “some people can’t eat gluten for medical reasons” and “that annoys me”. I wonder if it irritates him when diabetics need insulin or cancer patients undergo chemo? Maybe all forms of medical treatment get under his skin, poor guy. Someone has way too much time on his/her annoyed hands! Thanks for the page views, though.